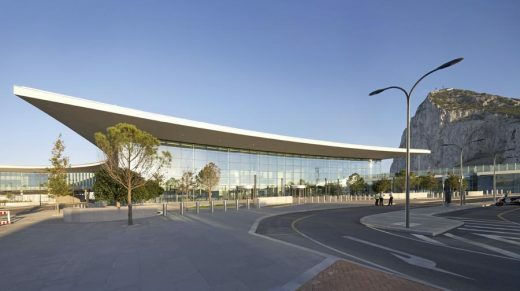 Gibraltar Airport’s uniquely situated new terminal building is modern, dynamic, transparent and airy. 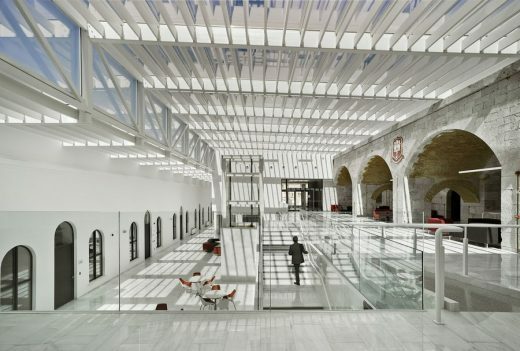 Designed by 3DReid and bblur architecture, it is a world class facility which has created opportunities for flights from Spain and the rest of Europe to Gibraltar. The new terminal is the first building visitors will see when they enter Gibraltar by air, road or on foot and is located immediately at the frontier, with the Rock as a backdrop. Sited within an extraordinary and spectacular landscape, it is bound by very tight constraints on all sides with the frontier with Spain to the North, the existing airport runway to the South, Winston Churchill Avenue to the West and tapering land with RAF restrictions to the East. 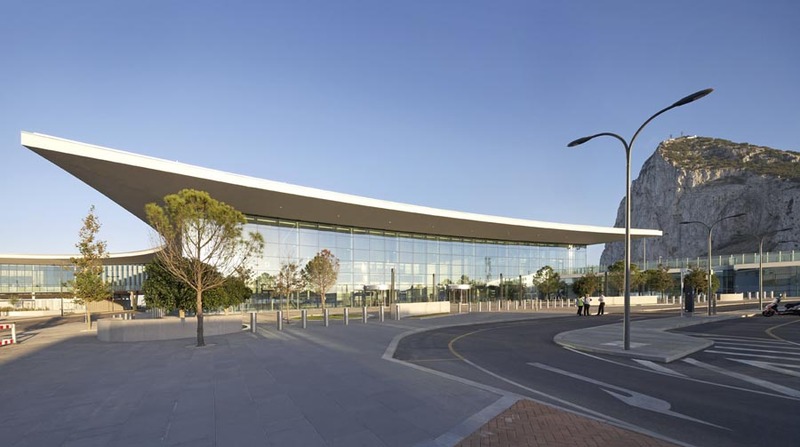 The building is 2-storeys high and covers 19,600sqm. 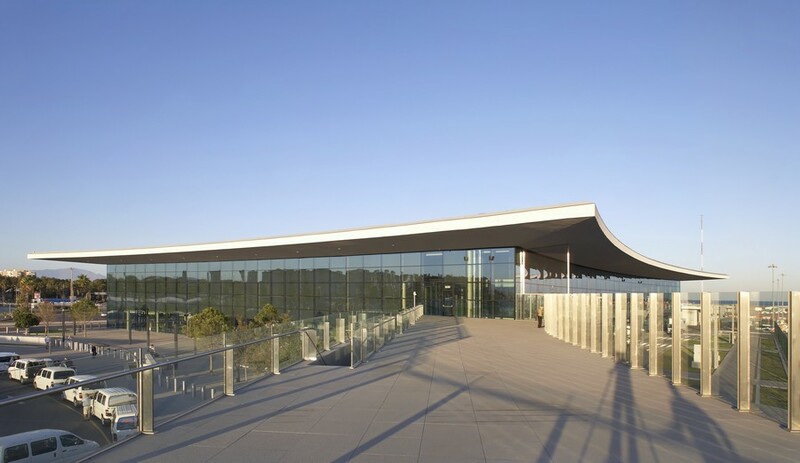 With over 20 years experience in aviation the design team approached this commission with consideration and empathy, and created an important public space both around and inside the terminal. A large over-sailing roof, providing shade and shelter to the fully glazed walls which maximise views to the Rock and across the straits toward Africa and the Atlantic and the Mediterranean, reflects the terminal’s aviation function and maritime location. 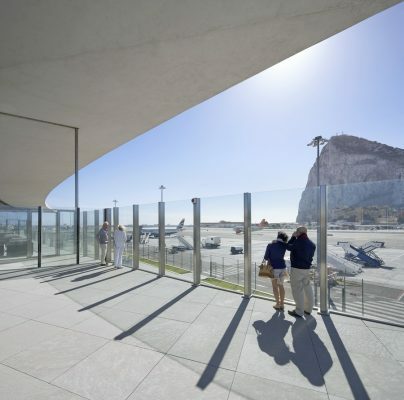 The forecourt creates a new landscaped park providing a generous welcome to Gibraltar and the airport and an identifiable ‘place’ at the frontier, a place to meet and greet whether on a local or extended journey. 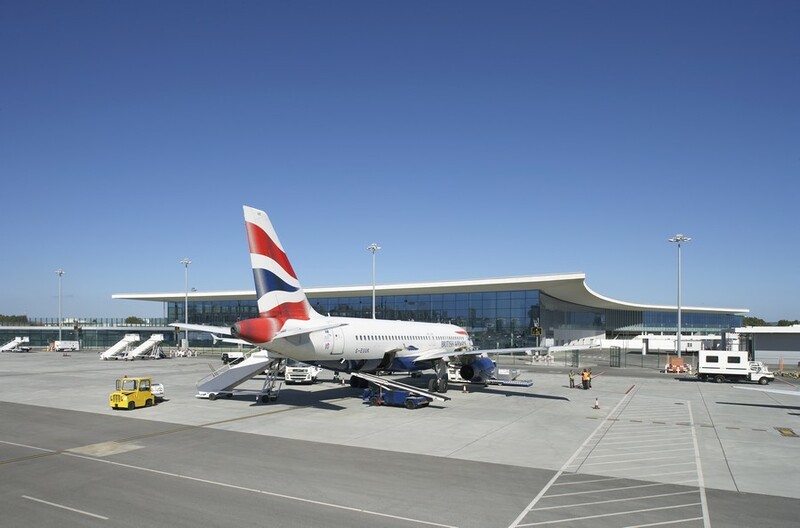 There are double height spaces within the terminal and an extensive airside roof terrace, designed as an extension to the departures lounge. The terminal which operates over two levels with an area of 19,600sqm has a primary check in and arrivals concourse at ground floor on the West side of the terminal. The terminal was also designed to accommodate entry and exit of passengers directly at the frontier. 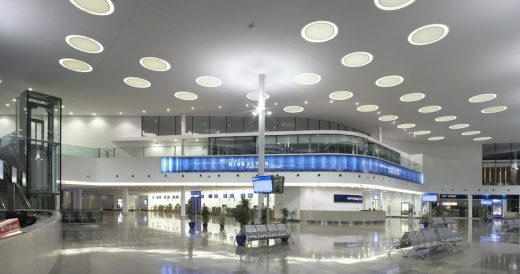 • The use of glazing achieves transparency between the interior and exterior, allows the terminal to be predominantly naturally lit and provides extensive views out of the terminal. 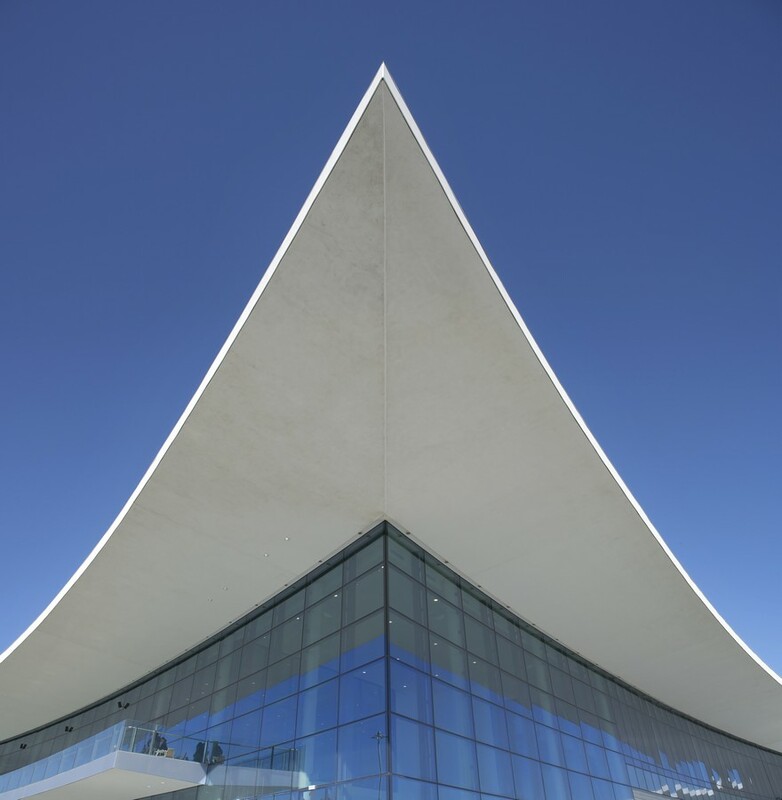 • The fifth elevation (roof) very important as seen from the rock – use of roof lights which are laid out to visually guide passengers through some of the more internal routes. The rooflights generate subtle animation of the space thoughout the day from throwing disks of diffused sunlight onto the floor to capturing the blue glow in the early evening. Energy efficiency has been a key consideration. The design incorporates a large roof overhang to provide a high level of solar shading which maintains a cool environment. High performance double glazing and automated roller blinds contribute to enhanced energy performance. Certain features of the design result from the building’s proximity to the sea. 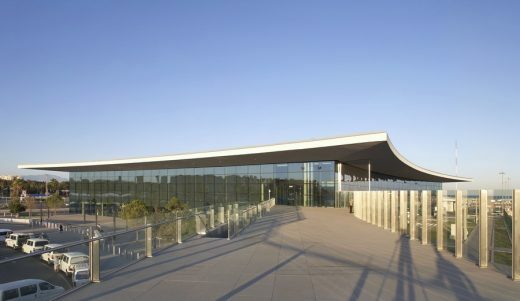 In addition to the need for close attention to detailing and specifications for external elements because of the corrosive marine environment, there was also concern about maintaining the appearance of the glazing, not just from salt-saturated air but also wind-borne sand and dust particles. The design solution includes a special external cleansing system that intermittently rinses the façades to eliminate accumulated material. The de-ionised water used in the system further improves the effectiveness of the rinsing process. Buro Happold’s Fire Engineering developed a holistic fire safety design that integrates a combination of passive and active fire safety measures, along with management measures to combine to give a simple but robust fire strategy for the building. This provides several benefits: offering life safety protection to the large numbers of passengers and staff using the terminal, containing fire and smoke to limited areas, and reducing operational disruption in the event of an incident. Daniel Bérubé and Matthew Bedward led the 3DReid design team from concept to planning scheme design until they left to form bblur architecture in 2008. 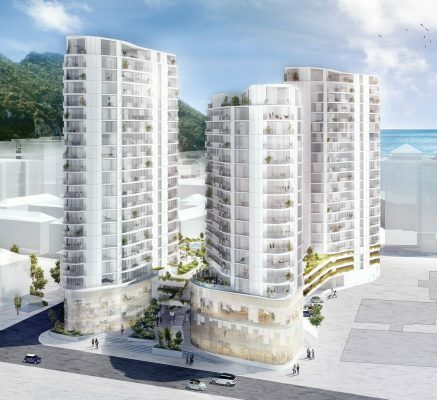 3DReid and bblur architecture agreed to collaborate throughout the design development and delivery phases of the project with Daniel Bérubé leading the project as concept guardian and lead designer working with 3DReid and the contractor to deliver the Terminal and associated infrastructure. This was to ensure that Dragados S.A. the Spanish contractor who was awarded the design-build contract of the Terminal and associated infrastructure works remained faithful to the original design intent. 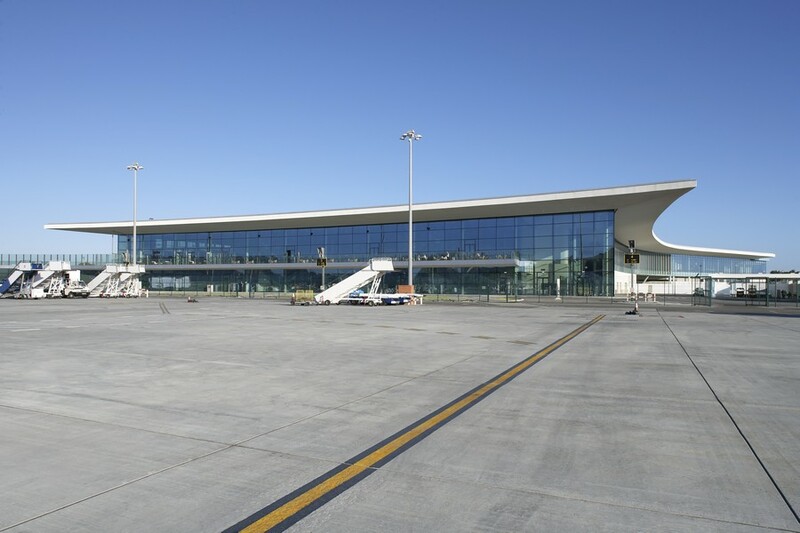 During the course of the project delivery bblur architecture was also commissioned to design the interiors of the terminal, and to redesign the terminal forecourt and adjacent public realm with Spacehub. 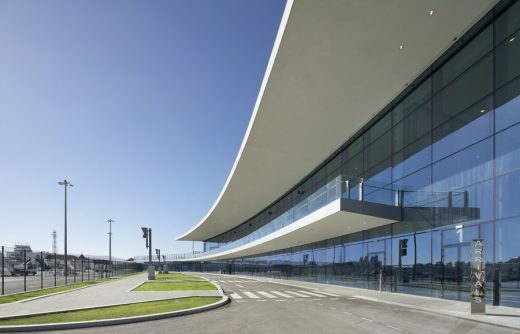 In addition to the main terminal building, 3DReid and bblur architecture have designed the Park & Ride facility, a 6 level multi-storey carpark, on the opposite side of runway. 3DReid is an international architecture practice renowned for its innovative thinking and inclusive and collaborative approach. Driven by a team of over 200 individuals the practice operates across five UK studios in Birmingham, Edinburgh, Glasgow, London and Manchester, with overseas offices in the Middle and Far East, and alliances in Australia, China, India, Russia and Europe. With a project list spanning over 30 years, its portfolio includes many dramatic and award-winning designs. 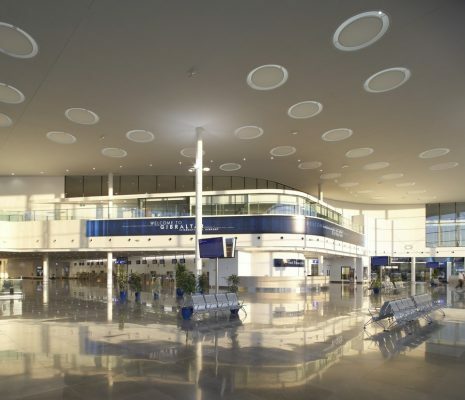 Peter graduated from the University of Newcastle-upon-Tyne in 1986 and has been designing airports for over 20 years. Now an established airports specialist, with a keen understanding of the political, business and stakeholder drivers, Peter is highly active in generating research within the sector and regularly speaks at major industry conferences. With a passion for the process of realising projects in the most sustainable way, he provides strategic knowledge and experience of large-scale developments and operations, including master planning, development programmes, terminals, ATC towers, hangars and cargo facilities. His experience extends to over 20 UK airports in Central and Eastern Europe, the Middle East, Asia, Australia and the Caribbean. bblur architecture is a young design led, competition winning architectural practice founded in spring 2008 by Matthew Bedward and Daniel Bérubé and is based in central London. The practice is currently designing a range of cultural, transport related and strategic planning projects. In its first four years, bblur partner Daniel Bérubé, has led the design and delivery of Gibraltar International Airport Terminal and the multi-storey Park and Ride Facility. bblur has also designed and delivered a series of significant projects in the UK. These include the innovative sculptural landmark Slough Bus Station which now forms a new and confident gateway to Slough. The practice has also transformed the Streets of Slough with an extensive town wide regeneration of the Public Realm including the creation of a new 400m long boulevard and linear park and new forecourt to the railway Station. This project forms the spine of an ongoing regeneration scheme called ‘The Heart of Slough’. Matthew Bedward, founding partner of bblur, was the author of the award winning Farnborough Airport while he was design director at 3DReid. 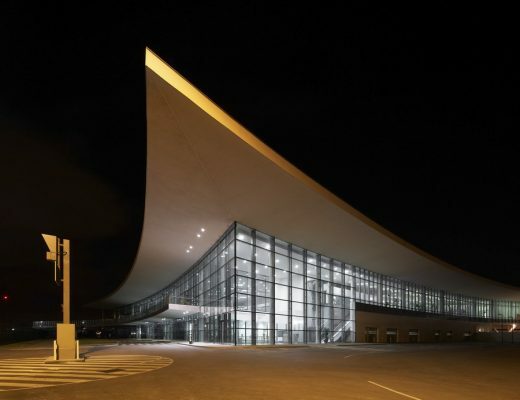 Subsequently bblur architecture was retained by TAG Aviation to design a new Ground Support Facility at Tag Farnborough Airport and complete the vision for Europe’s leading FBO. This building was completed in April 2012. Most recently bblur completed a new London Visitor attraction at the O2 Dome in Greenwich for AEG Europe. 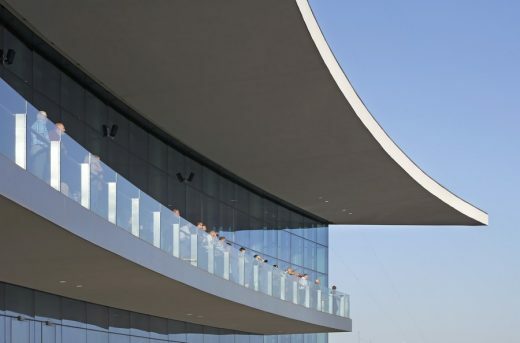 Buro Happold, the lead designer’s asked bblur to assist them in designing and detailing a fabric walkway which enables visitors to climb over the dome to take in the glorious views of East London. As support for this scheme bblur designed two free standing pavilions which act as the ‘base camps’ for visitors to the attraction. bblur architecture is currently involved is a series of other exciting projects, a cultural centre in Slough, further airport work and significant master planning schemes in the middle east and has also recently won a commission to design a small cultural facility in La Rioja, Spain.